Trump also faces skepticism from industry stakeholders, who are wary of some details that emerged in a draft outline of the plan that recently came to light. Senate Commerce Chairman John Thune (R-S.D.) is expecting to see the proposal after Trump’s State of the Union address Jan. 30, and he said the plan likely will call for approval of a couple of billion dollars in public funds to leverage its top-line aim of what is now $1.7 trillion over 10 years. Thune noted his colleagues on the transportation policy committees will disagree over ways to reach funding goals for big-ticket infrastructure programs, which, based on a six-page draft of the plan, will partly entail aggressive private-sector investments and a significant reliance on tolls. Advancing a long-term plan would gain bipartisan backing, especially when lawmakers review the plan’s particulars, Thune emphasized, adding that Trump’s cheerleading of the proposal would help ensure its passage this year. Infrastructure is the White House’s top legislative priority for 2018. “I think there’s a momentum behind this, and if the president really weighs in heavily, I think there’s a good chance it could pass this year,” Thune added. TALK ABOUT IT: On our Facebook page. Trump told mayors at the White House on Jan. 24 he would be detailing his infrastructure funding plan during his State of the Union address and roll out details of a $1.7 trillion proposal in the coming weeks. Mayors were visiting Washington for their annual winter conference. “We’re also working to rebuild our crumbling infrastructure by stimulating a $1 trillion investment, and that will actually, probably, end up being about $1.7 trillion,” Trump said. Trump’s chances for advancing his plan would benefit from strong endorsements from stakeholders. Yet, already, key freight groups have criticized proposed tolling provisions in the White House’s draft outline, first published by Axios on Jan. 22. American Trucking Associations President Chris Spear was among industry leaders concerned about the proposed funding alternatives. “We have serious concerns about the unintended consequences of tolls, including their inefficiency, disruption to traffic flows, diversion to secondary roads and negative impact on local economies,” Spear said Jan. 23. ATA recently called on transportation leaders on Capitol Hill to establish the Build America Fund, which could generate about $340 billion over 10 years through a 20-cents-per-gallon fee on transportation fuels. While trucks make up 14% of vehicle miles traveled on highways, the industry currently fulfills approximately 45% of the Highway Trust Fund through fuel taxes and trucking-specific excise taxes. 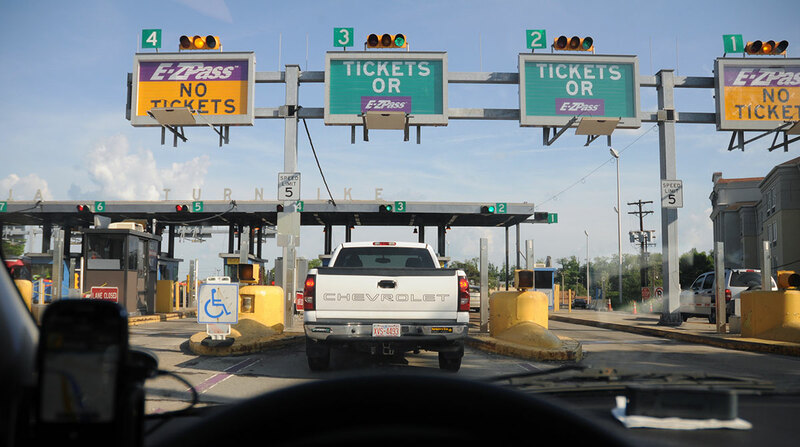 We have serious concerns about the unintended consequences of tolls. The U.S. Department of Transportation manages the trust fund to assist states with paying maintenance and repair costs. ATA has joined many freight stakeholders in calling on congressional leaders and the administration to approve an increase in federal fuel taxes. The tax on diesel, trucking’s main fuel, is 24.4 cents per gallon; it’s 18.4 cents for gasoline. “This plan is not innovative or good policy — it is simply a nationwide plan for [hashtag] TrumpTolls,” she said. The office of House Transportation and Infrastructure Committee Chairman Bill Shuster (R-Pa.) indicated the chairman will comment about Trump’s infrastructure plan after it is unveiled. The White House, meanwhile, has not confirmed the draft’s authenticity, which Politico also claimed to have obtained. As a candidate, Trump described himself as the “builder-in-chief” and promised to unveil a $1 trillion, 10-year infrastructure funding plan in his first 100 days that would rely heavily on investments from the private sector.